In the heart of Africa, on top of the equator, and more than 5,000 meters above sea level, lies an ice-capped massif with a mythical resonance: the Mountains of the Moon. The mind-tickling idea of such a wondrous thing as eternal snow in equatorial Africa, and the sheer inaccessibility of these mountain, have added an air of mystery to the mists and clouds that constantly veil it. The Rwenzori Mountains are well known for their extravagant plants. At higher elevations, certain species grow unusually large owing to powerful equatorial sunlight at daytime and the chills of snow at night. Combined with wild and jagged landscapes, this ‘botanical big game’ evokes a primaeval atmosphere. ​Sebastian Schutyser captures undented, pure nature exquisitely with infrared black and white film. The photographer eradicates the most colors instead puts heavy emphasis on both details and textures of the subject and tries to carry innate beauty of it. Furthermore pure white leaves and dark fog that lost native colors evoke a dream like atmosphere in each print thus create an ethereal universe, an unreal Paradise Lost. Just like the Moon, be seen but not reachable, Schutyser’s ‘Flowers of the Moon’ is too for real yet is hidden and fairly mythological. 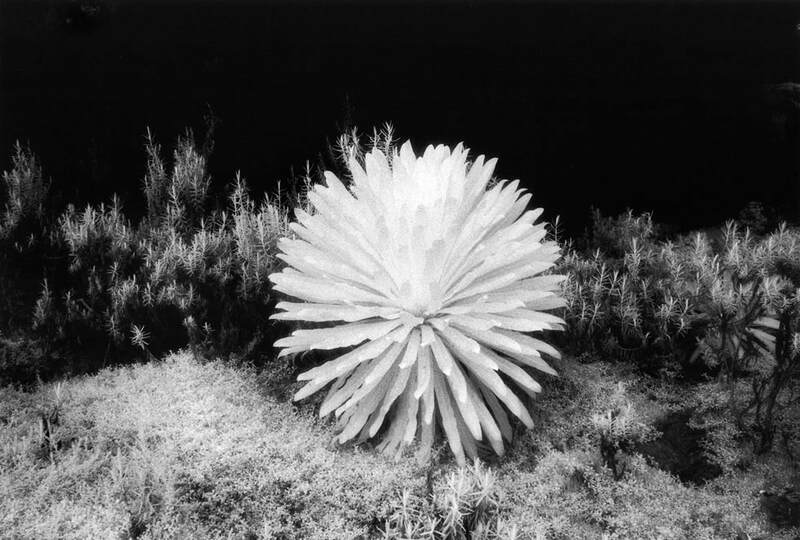 In addition, using retrospective black and white films as well as a documentary approach to flora of the Mountains of the Moon he points out a rough reality beneath the great Mother Nature: serious environmental issues such as advancing deforestation and global worming that threaten the earth are satirically suggested through breathtakingly beautiful images.